Some wonder what's the point in keeping a daily weblog "blog." I never really had an answer. Every would-be response sounds self-absorbed like my opinions mean something. Many of the "hits" come from pictures that I post that are received and/or routed through Google images - they don't really read my commentary on "all things," which is my mission. On the other hand, what's been accomplished on this site in the last 47 days has been the seeds of my memoirs in the television business. I don't know if a collection of my anecdotes would make a good book and I certainly don't know if anyone would read. But the stories resonate for the few, and are now easily accessible to me on the World Wide Web. Since the Backtime reboot, I've unearthed experiences from my own mind with memories triggered by various people and places, and now: Atlanta 1996. Orlando led Atlanta 3-games-to-0 in the NBA Eastern Conference Semifinals. So we were going through the motions and we thought the Hawks would as well. The Atlanta-based Turner Sports crew I was working with all had thrown in the towel on their hometown team. 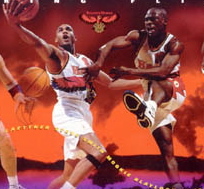 But Smitty and Mookie (one of my favorite backcourts ever) weren't done. Steve Smith hit 7 3's and filled it up for 35, inspiring decibel levels that were rarely reached in the old Omni. The series continued. We all had to board a plane to Orlando. And freelancers like me got paid for an extra game. It was a hot and nasty month to spend in Atlanta at the Georgia State Fair Olympics. Most of the time was spent at horrible Georgia State dorm Carter Hall, that was converted into a crew hotel with third-world amenities. Or it was in the catacombs under Atlanta Olympic Stadium, now Turner Field, slaving away at a graphics desk on the world feed of track & field, for a Finnish producer/director that I could barely understand. There were a few nights to let off some steam, but each day was grinding misery. Until the action on the track took on a life of its own. In our graphics cave, we were chugging constantly. Individual and heat lineups, results boards, schedule of events - what's next up? But don't miss any jumpers, throwers, or medal ceremonies. Was it the preliminary or the semifinals of the women's 400 intermediate hurdles? Was the bulky Romanian on his 2nd or 3rd hammer throw? We were always chasing our tail and my mind was soup. Until that transcendent moment. The 200M Finals. Michael Johnson had already won the 400M and was shooting for the unprecedented double. He came out in his gold shoes, stretching and bouncing around. And then everything stopped. There were no high jumps or shot puts. The 200M Finalist lineup was on the screen and the individual IDs were locked and loaded. All we had to do was watch history. My graphics operator read my mind and simply said, "Go." I sprinted. Not quite as fast as Michael Johnson, but around a couple of bends, up a ramp, and to the corner of the stadium infield just in time for the gun to go off. Johnson made the turn right in front of me. And I saw history. 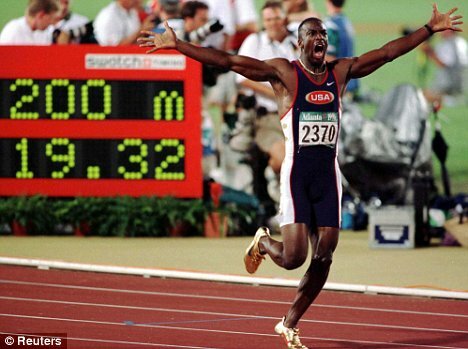 Michael Johnson shattered the world record. It was one of the great athletic moments in human history, and I saw it with my own eyes. It made the last few days of the Olympics a little more palatable. That and the check I received at the end. Thank you very much - first month, last month, security deposit on an Upper West Side bachelor pad. 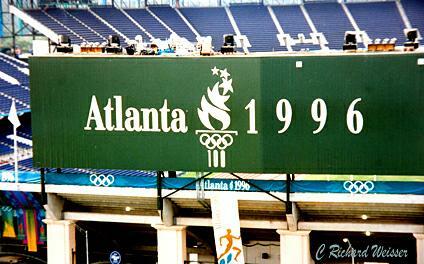 But the Atlanta experiences of 1996 wasn't done. They got even better. Part II tomorrow.